Prof. S. L. Bapat of Department of Mechanical Engineering has invented a compact drive mechanism for a reciprocating machine. Reciprocating machines are generally power consuming type or power generating type. Drive to the above machines is given through a drive mechanism comprising crank shaft and connecting rod arrangement(s) connected to piston(s) reciprocating in cylinders). of which the piston rubs more against the corresponding side of the cylinder causing uneven and non-uniform wear and tear to both the piston and cylinder. This may lead to leakage of the working fluid and malfunctioning of the machine. In order to rectify the problem reconditioning/replacement of the piston and/or cylinder liner may be required. Balancing of side force is done by attaching balancing weights to the crank to reduce the vibrations. However, in a single cylinder drive mechanism it is not possible to balance the side force completely and hence some vibrations are unavoidable. Wear and tear to the gudgeon pin and crank pin are unavoidable, calling for the periodic replacement. Breakage of the above pins may also occur at times. The compact drive mechanism consists of two horizontal circular discs parallel to each other, both having a coinciding circumferential groove of same size and shape. One of these discs is stationary while the other (driving disc) is rotated using a prime mover. A vertical (driven) disc with external surface matching the curvature of the grooves is placed in between the two horizontal plates. It rotates in the grooves about the central axis of the mechanism and also about its own horizontal axis, which ends up in a planetary motion. This vertical disc has equally spaced circular holes, with same pitch circle diameter through it. Similarly, the horizontal stationary disc has same number of holes to hold tubes acting as cylinders. Two circular rods are coupled to each other at right angle to obtain a L-shaped member. The horizontal limbs of such L-shaped members are inserted through holes in the vertical disc and the guide sleeve where they rotate and reciprocate and act as load bearing limbs. 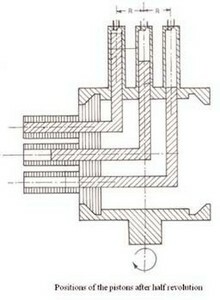 The vertical limbs act as pistons and reciprocate (and simultaneously rotate) in the respective cylinders mounted on horizontal stationary disc. One rotation of the vertical disc is equivalent to two strokes (one upward and one downward) of each piston. Thus, the rotary motion is converted to reciprocating one using this compact drive mechanism. The drive mechanism enables it to have large stroke to diameter ratio. Moreover, the orientation of the drive mechanism has no effect on the performance of the application for which it is used. The line contact between the mating members ensures least frictional loss. 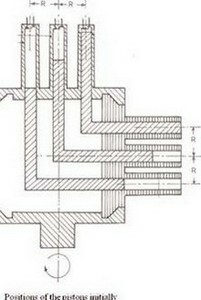 The number of piston-cylinder combinations and angular phase difference between them can be adjusted within the geometrical constraints. The current invention aims to provide a compact drive mechanism of a reciprocating machine which is efficient in performance and allows the piston to reciprocate in the cylinder linearly thereby eliminating side thrust.